Our beloved chaplain, Schemahieromonk Ambrose (Young), who has retired due to illness, has provided a treasure trove of teachings and insights on the Orthodox Life in Christ, and theology. Because we say The Lord’s Prayer so often it is easy to catch ourselves running through it very fast, as if on automatic pilot, and not really paying attention to the words. So, beginning with this Reflection I would like to spend some time talking about this prayer, the only prayer the Lord Himself taught us. We begin, of course, with the single phrase, “Our Father.” This means that we are addressing the first Person of the Holy Trinity, God the Father. We are not speaking specifically to anyone else in this prayer, not to the Second or the Third Persons of the Trinity, whom we address in many other prayers. But because we know that God the Father is unknowable in His mysterious essence it is easy to pass Him by without a second thought. But this prayer brings us up short: we are speaking to Him, God Almighty, who created the entire cosmos and each individual one of us, through His divine Son, Jesus Christ. Further, as Christ Himself says: “No man can come to Me, except the Father, who hath sent me, draw him.” (Matt. 4:1744) This tells us that it is God the Father Himself who is working on us to come every closer to His Son, Jesus Christ. In our days we hear that there are some Christians who refuse to address God as “Father” any longer, seeing this as in some way “sexist.” (Christian Scientists have for a long time begun this prayer with “Our Father-Mother God, Who art in heaven…”, and so called Christian feminists, who can be men as well as women, by the way, prefer to use what they call “inclusive” language). But this is approach sets aside a whole body of traditional theology concerning the nature of the Persons of the Trinity. Thus the Father is the “monarch” of the Trinity. Equally important is this fact: if it was correct for Jesus Himself to call God His Father, how could we presume to know better? Moving gladly away now from modernist and heretical re-interpretations, the Holy Fathers suggest that when we say the words, “Our Father” we at the same time recall the tremendous opening words of Psalm 123 (in the Orthodox Psalter): “The Lord is my shepherd, I shall not want; He makes me lie down in green pastures. He leads me beside still waters…etc.” This, then, is the kind of “father” we have in God the Father—a loving shepherd who is looking out for us. On the Cross Jesus cried out “with a loud voice and said, ‘Father, into Thy hands I commend my spirit!” (Luke 23:46). Can we do less? Can we do less than this every time we say the Lord’s Prayer, giving ourselves completely and fully up to God the Father? In recent Reflections we briefly examined the history of the early Church’s devotion to the Theotokos. Although a whole book could be written on this subject, I cited just a few of the earliest Fathers in order to show that our veneration of the Panagia is not at all a late development in the Christian Church, but was there from the beginning. This brings us now to the subject of the Virgin Mary as an intercessor, a prayer warrior for us before her Divine Son, Jesus Christ, remembering that Christ worked His very first miracle (changing water into wine) at the request of His Mother. As Orthodox Christians we believe that we can ask those who have gone ahead of us into the Kingdom of Heaven to pray for us before the throne of God. Since in Christ all are alive, as Scripture witnesses, then the saints are able to hear our requests for prayer just as I am able to ask you, standing next to me, to pray for me. This applies most especially to the Theotokos, the greatest of all human beings. (St. John the Baptist was the greatest man “born of woman,” according to the Lord, but Mary is the greatest woman.) Thus we see in the earliest surviving examples of sacred Christian art Christ enthroned and, on one side, St. John the Forerunner, and on the other side, the Virgin Mary: both are lifting their hands in prayerful supplication to the Lord. So our veneration for the Mother of God and the saints is not worship, nor do we ascribe to them the power and authority that comes only from God. But we ask them to pray for us. “It's hard to think about the Panagia”, he writes, “without becoming reflective. Maybe it's the sweet face depicted on icons... For the Orthodox Christian, the Theotokos and the "warm and fuzzies" go together…The awe and tenderness that fills our hearts comes from the recollection of the way that she has answered our prayers. 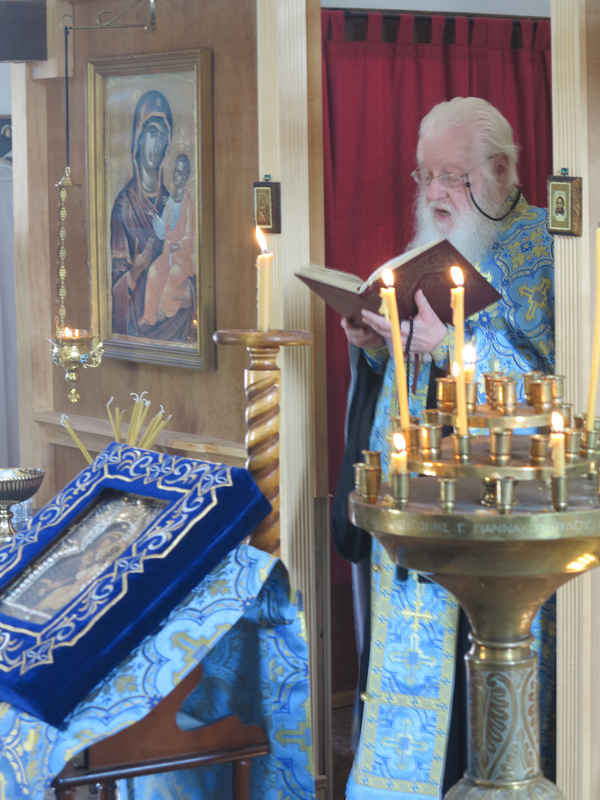 For two millennia the Theotokos has listened to the prayers of the faithful. That's why people turn to her in times of distress. They know she hears us and will intercede for us with her Son. With the Feast of the Dormition (Falling Asleep) of the Theotokos in August it’s time to resume our reflections on this most honorable, pure, and holy of all humans ever born. We have already mentioned the very earliest Fathers of the Church who wrote about the Virgin Mary in very clear and emphatic terms, always of course relating her to her Divine Son, Jesus Christ, and we’ve seen that the very earliest Christians showed her great respect and paid more than usual attention to her, unlike many Christians in the West since the Protestant Reformation. Unfortunately, very few Christians—of any stripe—read or much less study Church history, especially of the first couple of centuries, and so they remain largely ignorant of what the first Christians knew, believed, and taught. They assume that what non-Orthodox Christians generally believe today, in this very spiritually bankrupt generation, is what Christians always believed. But this is most emphatically not true. According to early Christian history it was very shortly after the death of the Theotokos that Christians began to annually celebrate her Dormition. Increasingly in these early centuries almost all of the earliest Church Fathers wrote praisingly and lovingly about her, and she became the subject of magnificent liturgical poetry, which has survived in the divine services of the Orthodox Church to this day. These Holy Fathers also understood that the Theotokos was a critical guardian of the Church’s doctrine of the Holy Trinity. How can this be, perhaps many Protestants would ask? Simply because, in and through her womb, she conceived and brought forth the God-Man, the Second Person of the Blessed Trinity, fully possessing the divine essence as does the Father and the Holy Spirit. Further, this divine Son is the only Image of the Father, and the only way to the Father. If the Virgin Mary did not bring forth the God-Man, but only a man, then the dogma of the Holy Trinity begins to slip away rather rapidly. For this reason an early Council of the Church gave her the dogmatic title, “Theotokos”—meaning the “birthgiver of God”—for her Son’s human nature and divine nature were not and could not be separated. How, then, can we Christians of the latter days, not call her, indeed, “Blessed”? Moving ahead into the second century (100-200 A.D.) concerning the testimony of the early Church regarding the Virgin Mary we come to a very interesting and important figure, St. Justin Martyr—important in many ways, not just because he speaks about the Mother of the Lord Jesus Christ. We must understand that although the Church was still technically in her “infancy” this does not mean that these early Christians were ignorant or unaware of the truths of revelation. Because of intermittent but sometimes savage persecution, however, these believers had not yet been able to think of themselves in terms that we now find so familiar and comfortable—such as “Holy Fathers”, the “patristic witness or consensus,” etc. All of that was still to come, under the inspiration and guidance of the Holy Spirit. Nonetheless, the documents that have survived from this period of time, either in originals or in copies, sometimes in Greek but sometimes in another language (like Syriac), do indeed speak of the Lord’s Mother. St. Justin was born between 100 and 110 A.D. and while still a young man he had a passion for truth and this brought him to an intense study of pagan philosophy. First he studied Stoicism, but also three other philosophical schools, including Platonism. In the process of this searching and studying he encountered Christianity and accepted Christ. Eventually he opened his own school of philosophy in Rome and was martyred in 165 A.D.
St. Justin wrote copiously but unfortunately only three of his writings have survived. These are referred to by other ancient Christian writers, so we know that they are authentic. In his “Apology” (or explanation of Christianity) he attempted to show the Emperors Antoninus Pius and Marcus Aurelius what Christianity was actually about, as opposed to the rumors and slander that were being circulated by the enemies of Christ. In this regard he was not interested in writing theology but history, and so he described in some detail the life of Christ, noting that he was conceived in the womb of the Virgin Mary, who was of patriarchal and priestly descent, and that Christ did not come into the world in the way all other men enter it, for his Mother remained a virgin after his birth. This the earliest documented mention of the ever-virginity of the Panagia, but it clearly reflects what was already always known, believed, and taught—in the oral tradition—regarding Jesus and His Mother. Through the early centuries this doctrine was spun out in magnificent sermons, poems and hymnography by many Fathers of the Church, but here we clearly see that it was already well known in very early times. Thus the divine motherhood and ever-virginity—contrary to what the Protestant Reformers came to believe and teach—were completely familiar to the first Christians and not later corruptions or additions. It cannot be emphasized strongly enough that the idea that the great respect shown and prominence given to the Mother of God is a later corruption or invention is thus again shown to be false. She was always there, always important, always an integral part of the divine plan. * “Mary and the Fathers of the Church: The Blessed Virgin Mary in Patristic Thought,” by Luigi Gambero. In Spiritual Reflection #60, I laid some groundwork for the correct understanding of the actual historical development and unfolding of the Bible as it is known today. Much, much more could have been said. In fact, whole books have been written. Those interested in this subject can pursue it for themselves on-line or in bookstores, both Orthodox and secular. I will mention here in passing the recent attempts to create so-called “Orthodox Christian” translations of Scripture. Keeping in mind that the Orthodox Church considers inspired only the Greek Old and New Testament, and not translations into other languages (no matter how faithful they might be), these new translations are sincere efforts and not without some value. They are also widely endorsed by a number of Orthodox clergy—primarily because it’s the only effort we’ve seen to do this in the English language, so far. But these translations have drawbacks, and a number of theologians and Orthodox scholars have pointed out those drawbacks. I neither endorse nor discourage the use of these translations by Orthodox Christians, and I suggest that the controversy surrounding them can actually distract a serious seeker from the most important thing in Scripture, which is the Lord Jesus Christ Himself. In the sixteenth chapter of St. Matthew’s Gospel we find ourselves pointed completely and absolutely to the one question asked of us, and which we must each, individually answer, regardless of whether our Bible is the original Greek, or a translation. Our eternal destiny depends upon how we answer. “Whom do men say that I, the Son of Man, am?” And they said, “Some say that thou art John the Baptist: some, Elias, and others, Jeremias, or one of the prophets.” (Matt. 16: 13-14). If we answer as did Peter, then we have made the same Christological confession of Faith that all mainline Christians have always made. But if we hedge, or if we give a different answer, then where are we in the divine plan? This is where we must all begin, each and every one of us, no matter how long we have been Orthodox Christians, or Christians of any stripe! Upon our answer to this one question rests absolutely everything—our faith, how we live, what we expect when we die, everything! Before we can be concerned about the many other questions that gnaw at Christians today (and they are indeed many and important), we must first answer this one: “Who is this man?” If we avoid answering it then we have already answered it with silence and turning away. Or if we find we are not answering this according to the Gospel account, then we need to do some serious self-examination, for this would reveal that we do not have Faith, or perhaps we have faith only in ourselves, or in someone other than Christ. C.S. Lewis once said that there are only three ways in which an intelligent person can look at Christ. 1. He was a madman; in which case we needn’t pay any attention to anything He said. 2. He was a liar; and again, we needn’t give Him any further attention. Or 3: HE WAS WHO HE SAID HE WAS! As Orthodox Christians we really have no choice but to opt for #3. And if we say that we do indeed believe that Jesus is the Son of the Living God,then we also know that we can turn to Him, trust Him, and believe that He will operate in our lives and, ultimately, if we let Him, He will transform us and take us with Him to heaven when we die. As I think everyone already knows, I serve as chaplain at a nuns’ Skete dedicated to the Feast of the Entrance of the Theotokos into the Temple, in North Central Ohio (GOA). As a result we here are very centered or focused on the Most Holy Virgin Mary and her majestic place in the Church and in God’s plan of salvation as the Mother of our Redeemer. In addition to regular Orthodox services we try to pray especially to the Panagia in her temple here, each day, asking her protection and intercession, and I like to read about her as much as possible. It’s important for us as Orthodox Christians to know and understand all of this since here in America we live in a predominantly Protestant milieu in which the Virgin is trotted out for the manger scene at Christmas and then put away, ignored, even disdained, not to be seen or mentioned otherwise. This was largely the reaction, or should I say over reaction, of the Protestant Reformers in the 16th century to what they perceived as excesses in the Roman Catholic Church of the Middle Ages. They ended up throwing out the baby with the bathwater. The testimony of the Church, from the very beginning, however, is that the Panagia was very well known, immensely loved, highly respected and sought after, and greatly venerated even in her own lifetime! So I thought it might be interesting for me to know, and to share with our readers, more about this interesting subject, for by doing this we refresh our understanding and our very souls with the evangelic simplicity of the earliest Fathers and their pure witness regarding the Theotokos. Remember: as Orthodox Christians we do indeed take our stand on the patristic witness of the early Church, as well as Scripture. Of course the Virgin is already specifically and significantly mentioned in several places in the New Testament, but the Apostolic Fathers—that is, those who were personally acquainted with the Apostles--also mention the Most Holy Mother of God at the very outset of Christian history, when the final and authoritative canon of the New Testament had not yet been fully and officially formulated by the early Church. The first of these—so far as documentary evidence is concerned (that is, actual surviving original writings)—is St. Ignatius of Antioch, who was martyred around 108 A.D. St. Ignatius is the child whom Christ took into His lap when He said to His disciples: “Suffer the little children to come unto Me”—so He knew even Jesus Christ Himself and therefore, doubtless, His Blessed Mother, who almost constantly accompanied her Son on his travels. He was a direct disciple of St. John the Evangelist and Theologian and the third bishop of Antioch (“where the disciples were first called Christian” [Acts 11: 2]). So he is not only “authoritative”, he was an eye witness of the events he described. Because this witness speaks of Christ as coming from both a human mother and a divine Father, we can see that the first Christians clearly believed that He was fully both God and man. (Take note, Jehovah's Witnesses and other modern day heretics!) But what I myself found interesting about this short quotation, and the others from of this early Church Father, is that he always mentions Mary in connection with her Divine Son. She is never omitted, never pushed off to the side as an “incidental character” in the divine drama, nor is she singled out by herself. She is central, but right next to her Son, where she properly belongs and where those who lived in the time of her Son saw, knew, and experienced her. This point is the same with all of the early writers of the Church. Now, having made this initial and fundamental point, in the following Reflections I will to continue to share with our readers the testimony of other ancient Christian writers, as well as other kinds of documentation, regarding the proper place and veneration of the Theotokos. I plan also to eventually say a few words about very early iconographic representations of the Virgin, which substantially corroborate the written testimony of the early Church. Some of this may be new to Orthodox readers, but it may also be useful when answering questions from non-Orthodox about our view of the Mother of God. I think most Orthodox Christians in America who possess a Bible don’t know the actual Orthodox view of the “Bible”, its development and use in the Orthodox Church, or that what they are using at home is probably either a Protestant or a Catholic translation. (There is an attempt at an Orthodox translation, less well known, about which more below.) If a Protestant translation or derivation is being used, it is missing a number of important books from the Old Testament that the Orthodox (and Catholic) Churches came to accept as inspired. Because we live in what used to be a predominantly Protestant culture here in America we have assimilated all kinds of mistaken ideas about Holy Scripture which are simply not historical, much less Orthodox. As a result, many Christians—not just Orthodox, by the way—have a vague idea that somehow the Holy Bible just sprang into existence at some point and has always been in the form that we see it in when we buy a copy in the bookstore. But this is untrue. The early Christian Church, both east and West, used the Septuagint (Greek) translation of the Old Testament (especially the Psalms and the Prophets) in divine services and readings, but the New Testament had not yet been formally collected, defined and established. Some local churches possessed certain of the Gospels and Epistles, others possessed less. Rarely did anyone have the complete collection because there wasn’t yet even a single standard for how to make use of the written Word nor an understanding that it would be as central as it became in later centuries. So, there was no “Bible” as we know it today for the first long centuries of Christianity. There were various Scriptures of all sorts, both from what we now know as the Old Testament and from the New, as well as apocryphal scriptures and even spurious and fraudulent “scriptures”. The Word of God, collected and bound all in one volume, did not yet exist. Therefore there were no Bible Study Classes. And even if there had been a Bible such as we know it today, most people still could not read. So the teaching of Christ and the preaching of the Apostles was mostly being transmitted by word of mouth—an incredibly rich oral tradition. It wasn’t until the time of the early Church Councils—beginning in the 4th century and continuing on--that a definitive canon (list of accepted books or a rule of readings) was established by the Orthodox Church of East and West, although a few early Holy Fathers had issued more or less similar—but not yet authoritative-- “lists” during previous centuries. Only then did it become possible to even speak of the Bible as one book. But even at that time, the Church did not issue or publish the Holy Scriptures as one volume containing both Old and New Testaments. Rather, everything was contained and preserved in several books and all of these had an important liturgical use. Thus, the Psalter from the Old Testament was one such book, used then and now constantly in Orthodox divine services. The most important prophets from the Old Testament, as well as the Book of Proverbs and a few other writings, were in still another book, used primarily in the readings for various feasts and saints in the Matins (Orthos) service. The four Gospels were gathered into one book, called appropriately, “The Gospel”, and enthroned upon the Holy Table in the altar as the “icon of Christ in words.” The Epistles were in another book. Each of these books was brought out and read at the appointed time in the liturgical cycles of the church, both daily and yearly, and propounded upon in sermons, as appropriate. (It has been said that if every Bible in the world were to disappear, 80-90% of it could be reconstructed from the liturgical services of the Orthodox Church.) Not until long centuries later did books called “The Bible” begin to be published in Greek, Slavonic, and other languages. This is not to say that there is anything at all wrong with Bible Study groups! My point is only to show that our Orthodox history regarding the origin and history of the Bible is somewhat different than Protestantism, and we shouldn’t take it for granted. There is definitely more than meets the eye here. Also it should be pointed out that, unlike fundamentalist Protestants, we Orthodox do not believe that literally every single word in the Bible is divinely inspired and dictated from heaven. We do of course believe in Divine Inspiration, but our understanding of this is that it is primarily the moral law of the Old Testament that is divinely dictated, while other books are more or less inspired and some are merely historical chronicles. The New Testament is on another level all together. Since we believe that the Church brought forth the New Testament from within the already existing Tradition, the Church is the one who possesses the final and ultimate authority for understanding and interpreting Scripture. Of course the writers of the Gospels were most certainly inspired by the Holy Spirit, but even then this does not apply literally to every word. So, we have a more subtle and, I believe, refined understanding of the Bible than most Western Christians have. Finally it should be noted that Holy Scripture is not the only source of revelation for Orthodox Christians. We accept also the divine inspiration of the writings of many Holy Fathers of the Church, the dogmatic decrees of the Church Councils (for example, on the Holy Trinity, the Incarnation, etc. ), hymnography, and also authentic iconography. Therefore we study and seek to understand the written Word in the context of all these sources of revelation, and not only by itself. This sets us apart from Western Christians, but it also means that we have a great treasure to offer them, if they wish to learn from us. This makes for good film, but in actuality, Joseph of Arimathea did not speak these words on Calvary, but his words are appropriate, for they are a quotation from the Old Testament book of Isaiah, 53:5. This verse is one of the many which speak of the coming of the Messiah, Jesus Christ, and His mission and destiny in this world. In fact, the whole chapter in which this verse is contained speak of the execution of the Messiah. But what does it actually mean? How are we to understand this today? A “stripe” is an old fashioned word meaning “wound”—something caused by a lashing or whipping, but primarily a “wound” of any kind. We are all familiar with the terrible “stripes” or wounds our Savior suffered in the flesh. So, we are healed of our sins, our iniquities, by Christ’s shed blood, and we are therefore “washed in the blood of the Lamb”—Christ being the fulfillment of the paschal or Passover Lamb. And what does it mean to be “washed in the blood of the Lamb and therefore healed of our iniquities by His stripes? Simply this: by Baptism and an active and worthy participation in the Holy Mysteries or Sacraments of the Church—particularly confession and the Eucharist—we are thus “washed”. Whenever we receive Holy Communion we receive both the Body and the shed Blood of Christ, the Lamb of God, thus renewing our healing. Early Christians also understood the Sign of the Cross, made over the upper body, to be a symbolic “washing in the blood of the Lamb,” once again covering ourselves with the shed blood of the Son of God, in order to heal our spiritual wounds. This helps us to understand that our Lord Jesus Christ not only bore our sins, but He also “carried our sorrows,” and still carries them to this day, whenever we are meek and humble enough to come to Him. The young man—he told me his name is Thomas—said that he is a “seeker”, a “searcher”. By means of his quite lucid and respectful conversation and questions I saw that he is truly a “God-seeker,” as we would say in Orthodoxy. I answered his questions as best I could and also witnessed to him about the truth of Orthodoxy as the historic Church established by Jesus Christ, and I encouraged him to contact our local men’s monastery or women’s skete for further talks. I realized suddenly that no matter how dark our world looks today, and no matter how grim the future appears to be, and no matter what problems the Church has in this degenerate American/European culture, the Holy Spirit is still very much active and seeking to draw people into the nets of the Fishermen. His activity is ceaseless, and many are the opportunities that He arranges for us Orthodox to come into contact with other searchers and God-seekers. But of course we ourselves must be alert to those occasions and even make efforts to reach out to others, not by standing on a street corner and preaching (although there’s nothing wrong with that—there’s plenty of precedence for it in Scripture! ), but by being very best Christians that we can possibly be, modeling in our daily lives and behavior and interactions with others something of that supernatural grace and light that has been given to us by Christ through the sacramental life of our Church. However, Orthodoxy as a missionary Church in this country has, to date, largely failed. There are real reasons why we are still only one percent of the population after almost two hundred years of presence on this continent. What are these reasons? More than 150 years ago the future St. Innocent of Alaska wrote that seminaries in America should be teaching future clergy in English and the church services should all be in English. But this wish has been largely still-born, even in parishes where no one any longer understands Slavonic or liturgical/patristic Greek, except in a few places. And then, the education of Orthodox Christians has been somewhat abysmal. It is a fact that many “cradle” Orthodox do not even know that theirs is the true Church, the historic Church founded by Christ two thousand years ago, from which all of the other Christian denominations broke off. They often tend to think that they are Orthodox because they are “Greek” or “Russian” or whatever. Not because it is the very TRUTH. After my family and I converted in 1970 we were asked by a very sincere and sweet old Russian grandmother: “Why are you Orthodox? You aren’t Russian.” Enough said about this. And then there’s the very low level of Orthodox practice and observance of a Orthodoxy as a way of life among many of the laity…and, sadly, among some priests and monastics, too. Although there are of course some good exceptions, by and large the spiritual life of most parishes is pretty minimal. It’s mostly about going to Church on some Sundays (and not even regularly; and rarely on Feast Days) and raising money and keeping the old world culture and its languages going. Communion is infrequent; confession even more rare. Fasting is indifferent or non-existent, etc., etc., etc. Could somebody please explain to me what ANY OF THIS has to do with the Lord’s command in the Gospel to “Go and preach to all nations, baptizing them…”? !